Before I begin there are a few things I would like to say before going on to the report. I sat in front row (it was general seating), so I was really close to the stage. Also, I went in my Bombalurina costume (which I have created a new make up design for and I adore it!) I went with my friend Andrea (Drea) and my Nana. This was such a fun night. I swear, I've never had so many people take their picture with me. There was no Plato that played Macavity, Coricopat played Macavity. Well before CATS, Drea and I were getting restless. I put my make up and costume on, an hour before we were suppose to go cause my nana takes a while to get ready... So Drea and I decided to go walk around the hotel and scare a few people. The first person I saw I smiled at her and she gave me a dirty look. Some people were going to the pool and Drea was recording me for some odd reason. Then they asked if they could have their picture with me. Well of course I said yes. So Drea has a video of me getting my picture taken! WOO! Then I was tap dancing in the hallway with my Nana's cane cause, I like the Tap dancing number in 'Jennyanydots'. Then this woman came up to me and asked if I knew Susan Browns or something. I said I didn't and she asked where I was going. "To CATS." And obivous reply. She then asked which character I was and I said, "Bombalurina." And she told me her daughter was Bombalurina in the play and I was so thrilled. Sorry I have to add this, I say Bombalurina different from people. I don't know. When other people say it, it sounds pretty, when I say it it sounds ugly XD I dunno how to explain it.... hahaha!! "Wow..." And another said, "What are you suppose to be?" Then on the way to CATS, I had my head out the window waving to everyone. I got so many weird looks. Then when we arrived, my nana needed to park somewhere else so she dropped us off across the street. She went to hand me the tickets, and Drea closed the door on my arm! I was like, "Ow! Thats my arm Drea!" And she laughed at me... Then we walked over to the theatre and got in line. There were 2 doors, one on the right side of the theatre (which I think was backstage or something) and the left side which was the enterance. A bunch of the cast saw me waiting in line and one I beleive was Pouncival said, "Her costume is better then ours!" Then he said, "Your my idol!" Go me! Then the Producer came out and took my picture (yay!) and then she gave me her email so she could send me the picture and whatnot. Drea and I chatted and my Nana never came. I got really worried so I ran past everyone in line and ran around the block. Then I came back and she still wasn't there. Then she finally came and said she had to part like a mile away. I was just glad she was ok. We went into the theatre and ran to get front row seats. Overtrue: It was well done. Drea asked why no cats were on stage, and I told her, "There coming out right... now." And then they came out, I felt so specail! The way it was played was fantastic. The blue lights were pretty. 3 cats came out with glowy light up eyes. It was really cool. Jellicle Songs for Jellicle Cats: When all the cats came out, I was looking at their costuming design and examining the way they made it. The dancing was different in some ways but similar in others. Pouncival didn't look very happy. He made the same kinda face I made when I was in talent show hehe. The Naming of Cats: The Cats all reacted to their names (if they were said) By standing or itting up a bit higher then they already were. Or moving in a cat-like way. They leaned forward really far and in Drea's words, "There all up in my hood!" Victoria and Asparagus were looking at me and I made sure to smile (cause last time in St. Jacobs I tried not to smile). They sung it really good. The invataion to the Jellicle Ball: Victoria did very well. When she did the leg lfit, she did what I do and held her leg with her hand. Alonzo was the one who came out apose to Mistoffelees or Plato. The invatation (singing part) was very well done. For some off reason, I didn't see Munkustrap as the protector... more just like another chorus cat. The Old Gumbie Cat: The trio of queens were really nice singers. Jenny was a really really good tap dancer. Pounce and her were the only ones who actually had Tap shoes on. He was really god as well. The beetles wore rubber boots. I adored the Tap number! Bustopher Jones: He was funny during his song. He was always maing some odd comment about food. He gave Jenny his flower at the end. She was so happy. Singing was amazing and dancing (what dancing there was) was good as well. Mungojerrie and Rumpelteazer: The singing was good, but the dancing of the song was extremely well done. There were a lot of front hand sprints. the dance wasn't changed completely, but some parts were very different. There was no double cartwheel. but really it didn't matter. Ether way they rocked. Old Deuteronomy: Singing was awesome. The way each moved in a cat-like way was awesome. Tugger was really good at singing this song. I knew Old D would be coming from behind us so I knew what was going on. 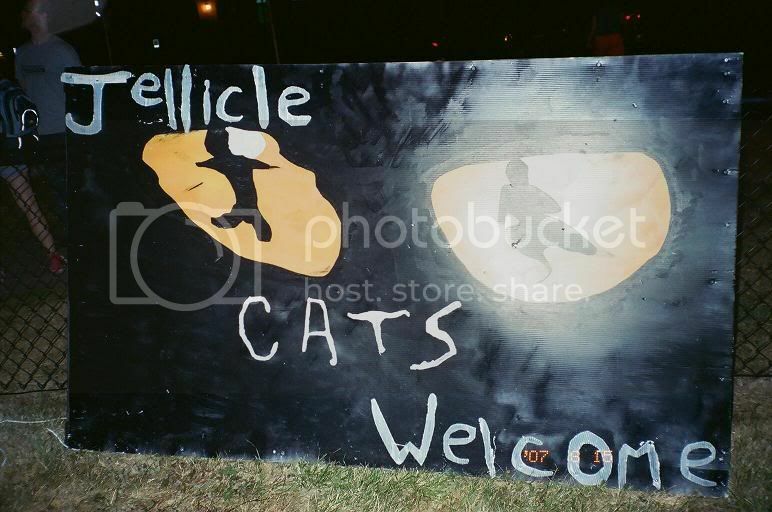 The Jellicle Ball: Wow... Just... Wow... The dancing was incredible. The solo Bombalurina usually has was taken over by Cassandra. Grr... I love Bomba (No offence Cass fans). The dance usually done by Vic and Plato was done by Vic and Alonzo (there was no Plato). I was too busy watched how smoothly they did it I forgot to see who was mates with who... When Griz came, Alonzo woke up and jumped out at the audience his face like inches away from theres. I told Drea had that been me I would have said something stupid like, "What up homie?" One of the cats jumped up at Griz and slappd her. I swear it looked as if he actually did. I didn't see Bomba during the second part of the Ball and I was really sad lol. Memory: They all scratched or hit her again. She same so beautifully. My friends Jaw dropped, literally dropped when she saw her, "omg! Her nailes are so shiney!" I told her, since she (Drea) has a really nice voice, if she ever played Griz she be singing and staring at her nails the whole time. Old D looked sad when Griz left. Pour D.
We went back inside and sat back down and relaxed. Moments of Happiness: All the cats started off sleeping. As Old D went on singing, Jemima woke up, and sung as well. Not all the cast was on stage. Some were off stage. Gus: The theatre cat: Gus didn't seem that old and that's probably because he wasn't that old as an actor. He was really funny when he remarked about how the kittens aren't trained how they used to be. Four queen kittens turned away. The queens were Jemima, Electra, Victoria and Etcetera. They looked pretty angry. Gus's Mic cut out once during the song. At the end when he made his attempt as a scary noise it sounded so funny. Growltigers Last Stand: For the first couple minutes on stage, Growltiger wasn't actually on stage. He came out 30 seconds before Griddlebone did. Alonzo stood on a barel laying on its sideand he slipped and hit himself in a very painful area (on purpous of course). The Siamese had competely brown heads (which doens't really make sence). They danced around with 2 long peices of cloth that resmebled water. It was neat. Skimbleshanks: During his song, Skimble's Mic kept cutting out. Skimble did a very good job singing the song. Everyone did. the train they made wasn't all that great :( I hate to have to have said that. It wasn't horrible though. Skimble was held up behind the train instead of standing on the car with its trunk open. When Skimble caught the mouse when they sing, "That they wouldn't be bothered by mice" he came over and threw it to me. I (by reflex) caught the 'mouse'. It was really funny. It actually did look like I was catching something. I kinda surprised myself! Macavity: The dancing was amazing, and the singing was incredible. In the begining, when Macavity kidnapped Old D, like in most productions, he made all the jellicles freeze. Demeter was dancing was really good. Bombalurina had a beautiful voice that really amazed Drea and I. In Bombalurina's solo part when the music picks up quickly, she moved so fast I was like, "Wow..."
Mr. Mistoffelees: His entrance wasn't amazing. He just jumped down off the top part of the set onto the car. The Tugger sung the beginning and Misto sang and then everyone joined in. Misto had such a sweet voice. His dancing was really awesome like, I'd kill to be able to dance like that. When he did the stradle jumps/ box jumps/ whatever you wanna call it jumps, he looked like he was flying. Drea claims he did 15 of those jumps. I don't doubt that; the guy was crazy with jumping! He made Old D reapear the same way in the video (through the pipe). Up up up to the Heavyside Layer: I thnk they sung it really well. I really liked this song. Smoke came from the set and didn't really go around the stage to quick. Griz went up the set and just walked off. They didn't have a tire for her to rise up on. Although they did have a stack of tires they could climb up on. After the show was just as fun as before the show. We went back to the lobby just to see if any cast would be there and sure enough there was some cast there. 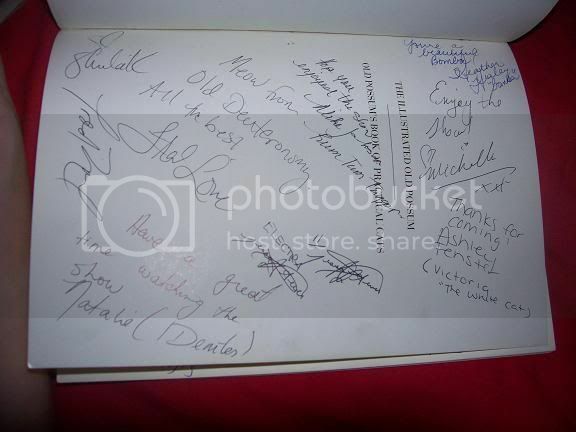 I got autographs from Old D, Bomblaurina, Tantomile, Mungojerrie, Asparagus, Jennyanydots, Pouncival, Skimbleshanks and someone else's whos I can't read -_- I missed out on getting Munkustraps, Demeter's, Griz's and someone else's. I was being shy that night grrr!! Why was I being shy! Then we went outside and passed a few people on the street who looked at me like I was insane (which I don't deny). Then we went to Tim Hortans and some woman asked why I was dressed up. Then when we went outside, someohe yelled a curse and I snapped back, "NO SWEARING!" Then we went back to the hotel and the dude at the desk said, "I'm sorry for staring." Click here to see the autographs I got. Click here to see the one from Bomba (its in the top right corner. 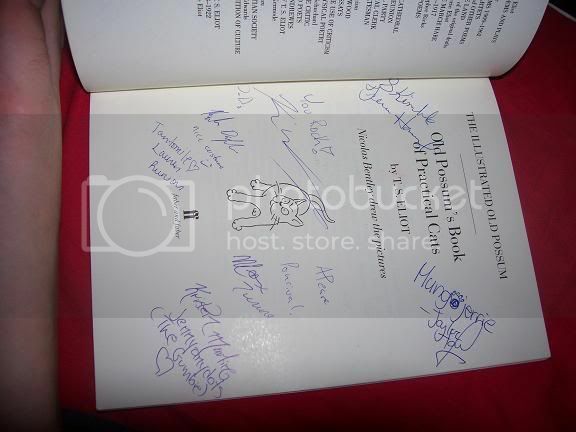 The other autographs on the page are from CATS in St. Jacobs). Click here for a video I made of the cast on youtube. Alonzo: He was a really good dancer and singer,. His design was very unique. He was white with more black then usual, but i still think he rocks. I smiled at him and made him smile back. Asparagus/Growltiger: He had such a sweet voice and he was such a darling cat. I don't know why but he was so kitten-like. I loved his character. I made him smile too! His unitard had nice brown patterns. Bombalurina: She was a personal favourite. Her singing was so fantastic. I would kill to have a voice like that. And her dancing. Just wow. She was a very very bright red. She didn't have leg warmers. Instead it was this mesh-like stuff that went a little higher then her shin. Bustpher Jones/ Gus: As Bustpher, he was very funny. But then again he was funny as Gus as well. He did a good job of making his voice sound proper to old and weak. I didn't even realize it was the same guy until I read the booklet. Coricopat/ Macavity: Cori (like Tanto) was blue and black. He looked really cool. He worse Jean shorts. He acted very mysterious. His tail was a blue braid. Macavity he was really scary looking. He wore a mask that looked like a demented lion. It was really nifty (LOL). Cassandra: She acted really classy and stuck up. Her tail was very thin. It was a braided tail. Her colour was a creamy brown. Demeter: She looked black and yellow but wore was looked like several different peices. Drea claimed that she had on a sweater from 'Garage' that they cut up. Her dancing was way better then her singing, i think. Electra: I acually got her mixed up with Jemima at first cause Electra is black and red. She was all black with red patches. She had a lovely singing voice. Etcetera: I mistakened her for Rumpelteazer (which in this production is spelt Rumpleteaser). She had orange strips apose to brownish/orange. She was a very graceful dancer and a nice singer. Exotica: I had no idea who she was. I was thinking, "Wtf?" But then I read the booklet and saw there was a Exotica. Her dancing was smooth and her voice was pretty. Grizabella: Drea's first comment was, "She's short." Which I think is the worst thing to first say about someone. She was a wonderful singer. her costume was actually really nice. And her shiney red nails were what pulled it al together hehe. Whenever she walked, she had a limp in her left leg. Jemima: She had a very dainty voice (which makes sence right?) I didn't know who she was at first but common sence kicked in after a few seconds. Her dancing was good but her voice was way better. Jennyanydots: Once again someone who's voice I'd kill to have. I guess Jenny needs an actor with an mazing voice too. her tap dancing was so good. Wish I could tap like that. her costume was weird in a good way. The top half of her was normal Jenny but the bottom half had the hanging stuff she has on when she's tap dancing with the cockroaches. Isn't that neat? Oh i loved it! 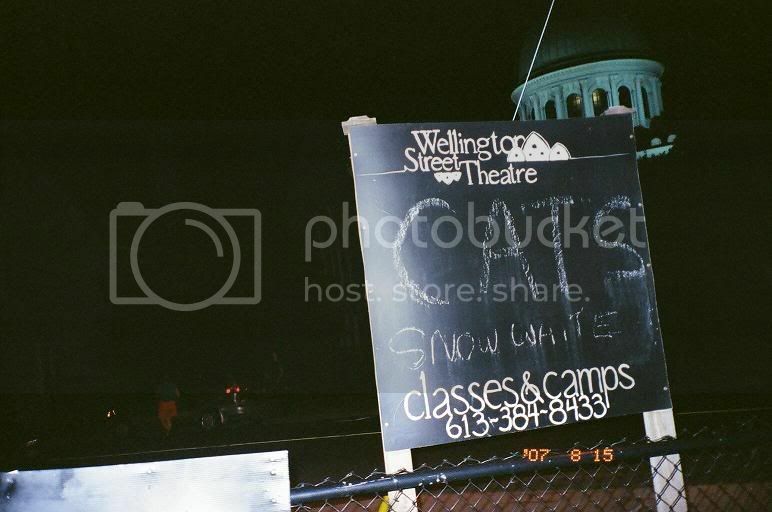 Mr. Mistoffelees: His costume was a black sleeved Leotard, gymnastic shorts (black) black tights and black legwarmers. I loved his voice it was so cute! (but very proffesional) He was so good at dancing (but Misto does need to be able to dance well). He has talent beyond beleif. His tail was made from yarn. 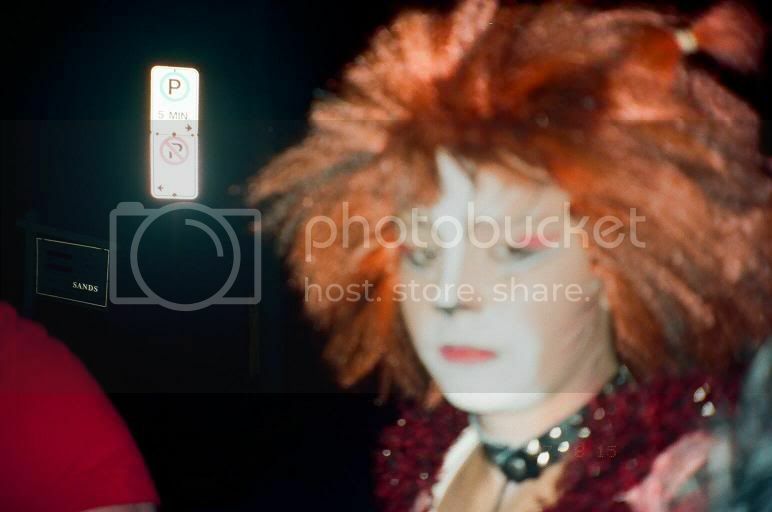 Munkustrap: He was an awesome Munkustrap. He sang all his parts very very well. The parts that he danced in were also very well done. He made an amazing silver tabby. Mungojerrie: Very cute in everything he did. I think he was a purr-fect Jerrie. His singing and dancing were amazing. Especailly all those front hand sprints. His tail was made out of yarn. Old Deuteronomy: His voice was probably the weakest of the cast, but it was still great for Old D. His costume resembled the costume gus has in the video, but it was a unitard he was wearing. More like a very baggy jacket that touched the floor. Pouncival: One of Drea's favourite characters. He has a white long haired wig with a big patch of brown on the back. His make up stayed relevently the same. He was a really good dancer, not to mention his singing. His tail was made out of yarn. Rumpleteaser/ Ghengis: (Rumpelteazer for proper spelling) Was very acrobatic. Rumpelteazer was a boy. His tail was made of yarn. He did front hand sprints just like Jerrie did. He had a great voice. I swear they looked the same, dispite the fact that their wamers were inverted. (black and orange warmers). Rum Tum Tugger: His mane was made out of faux fur. He had a silver belt as usual. Sadly he didn't shake his hips a lot. Maybe once or twice. He did play the cool cat. He did seem interested in Bomba throughout the play which was a nice twist. Skimbleshanks: His mic cut out a lot but he still had an awesome voice. And his dancing was amazing. Not much to say about him. He rocked! Tantomile: Tanto (like Cori) was blue and black. she didn't wear jean shorts like him though. She worse blue shorts that were suppose to look like jeans. Her tail was a blue braid. She acted very mysterious. Victoria: Her wig was a weird shape but she still looked good. Her tail was a white boa. She was flexible, but she couldn't hold her leg up during the leg lift without using her hand to hold it. She had a very pretty voice and incredible dancing.